Winter started late, destroying demand for natural gas in America. Natural gas storage touched record levels at the end of the refill season. NYMEX Henry Hub futures briefly traded below $2 per MMBTU and have staged only a modest rebound with the onset of colder weather. Dozens of North American energy companies are under severe stress and many will not be able to hang on for the inevitable rebound in prices from today’s unsustainable levels. More importantly, what will the future look like for the companies that can weather the storm and who will make it? In this article I will detail the many smart steps taken by Rice Energy (RICE-NYSE) over the past nine years that have put it in an excellent position to profit mightily from the inevitable rebound in prices. In a follow-up article I will detail the missteps of a former Wall Street darling, Ultra Petroleum (UPL-NYSE), that is facing a far more difficult future due to its debt-laden balance sheet and forays into unprofitable project areas. After founding of its predecessor company, Rice Energy, LLC in 2007 by longtime Blackrock and State Street energy analyst Dan Rice III, the Canonsburg, PA-based company began the acquisition of Marcellus shale acreage. Through a series of farm-ins and acreage acquisitions prior to the start of the huge ramp up activity in the Marcellus in 2012, Rice was able to establish a meaningful foothold into the highly prospective Marcellus shale of southwestern Pennsylvania. Today Rice holds 91,000 net acres of Marcellus acreage in Washington and Greene counties in Pennsylvania as well as 56,000 net acres of highly prospective Utica acreage in Belmont County, OH. Additionally, Rice Energy is the operator and 50% owner of a gas gathering and water handling company, Rice Midstream Partners (NYSE:RMP) that services its areas of operation. 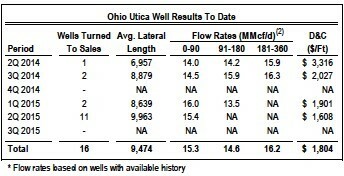 While there are numerous companies with more acreage than Rice in both the Utica and the Marcellus, there is virtually no company operating in either of the those two plays that has higher quality acreage, a history of drilling more prolific wells and, most importantly these days, the balance sheet to exploit its existing asset base in a higher price environment. As with any unconventional resource play, the financial success of any driller is directly linked to its acreage being located in the core of the play where virtually all of the economic wells are located. Rice’s acreage position in both the Marcellus and the Utica has yielded some spectacular production results to date. For example, the average initial production (IP) rate for the 114 Marcellus wells put into to production since 2010 was 10.1 million cubic feet per day (MMcf/d). Additionally, the strong performance of the company’s wells over the early portion of their lifetime allowed Rice to produce an average of 410 mmcf/d, or 3.6 mmcf/d per well, in Q3 2014 from its 114 Marcellus wells. The company has also been able to achieve substantial cost reductions per drilled and completed (D&C) foot. The 14 Marcellus wells put into production in Q3 2015 had an average cost of approximately $7 million each, down 16% from the 2014 average well cost. Though nearly all of Rice’s Marcellus wells have been on production for less than three years, we still have enough production history to make reasonably informed predictions for estimated ultimate recovery (EUR) per well. 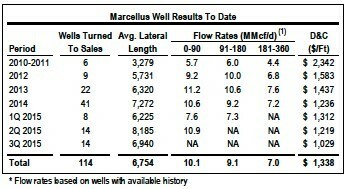 Due to the lack of the Rice-operated Marcellus wells older than three years and given that, according to the company, less than 10% of its Marcellus acreage has been developed, it is reasonable to expect the company’s average well to produce 8 bcf over its lifetime. I will further discuss the company’s Marcellus assets in the Valuation section. Despite only 19 net Utica wells producing during Q3 2015 Rice had average production of 199 mmcf/d, or 10.5 mmcf/d per well. Though the company has drilled a very small portion of its 56,000 net Utica acres, its outstanding production history indicates it is reasonable to see Rice’s average Utica well produce 10 bcf over its lifetime. the uncertainty over the company’s rate of acreage development. However, examining the company on a sum-of-the-parts basis we can gain meaningful insight into the value of Rice shares. 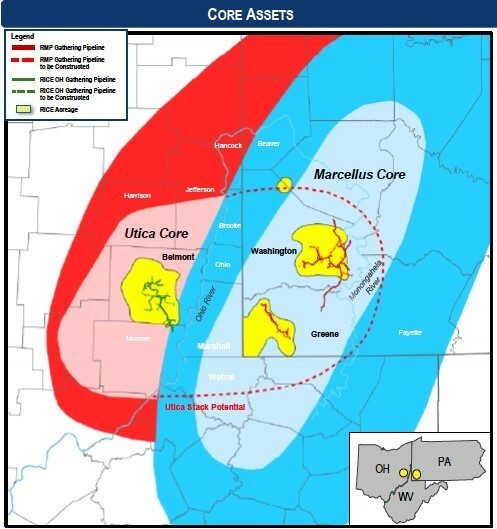 In the Marcellus, the company has 91,000 net acres and assuming 75% of it will eventually be developed (since some will have undoubtedly have access issues or impediments to development), and assuming four wells per square mile (640 acres), Rice can be expected to drill 427 net Marcellus wells. Should each of the company’s wells produce 8 billion cubic feet (bcf) over their lifetime, 3.42 trillion cubic feet (tcf) of potential production lies on the company’s existing acreage. If we assume that Rice’s Marcellus acreage would be valued by a potential buyer at $2 per mcf of gas in the ground, it is easy to see Rice’s Marcellus acreage fetch a value of $6.83 billion. In the Utica, should 75% of the company’s 54,000 net acres be prospective and the company is able to drill four wells per 640 acres, the company has the potential for 253 locations on its existing land base. Therefore, using an EUR of 10 bcf per well, Rice’s Utica acreage contains approximately 2.53 tcf and can be assigned a value of approximately $5 billion. Rice’s 50% ownership of Rice Midstream Partners (RMP-NYSE), its gas gathering and water handling system into which it has dropped the majority of its Pennsylvania midstream assets, can be conservatively valued at $200 million. Rice is in the early stages of delineating the potential of its Pennsylvania Utica acreage that sits directly beneath its existing Marcellus acreage. To date the company has drilled one well on its Pennsylvania Utica acreage that was tied into sales in August 2015 and according the company was flowing at 12 mmcf/d. While this a promising start, much more information is needed before assigning value to Rice’s Pennsylvania Utica potential. 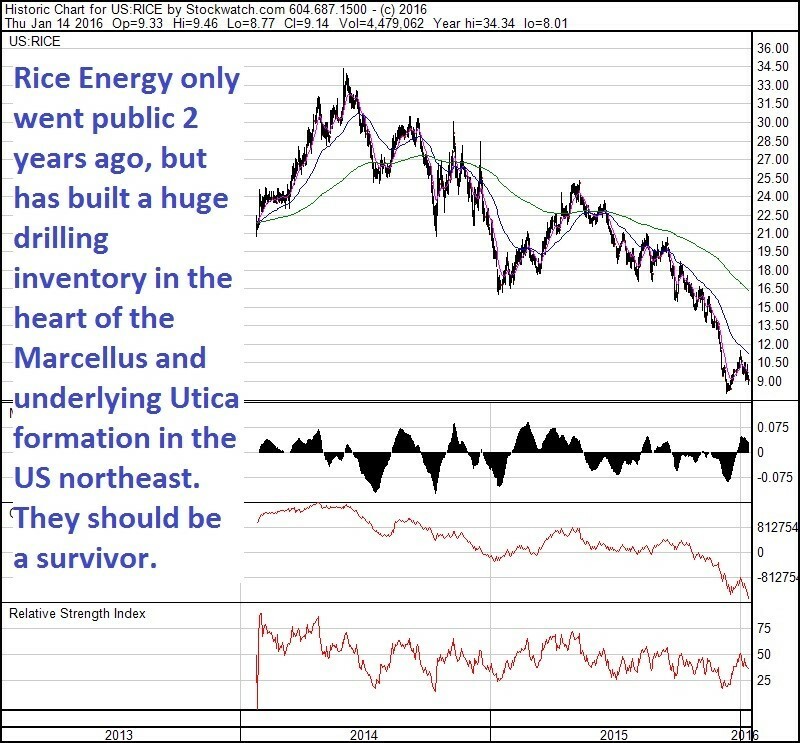 However, Rice Energy is unlike all of its peers since it has the highest quality acreage in both the Utica and the Marcellus that has allowed it to reach over 600 mmcf/d of production with the drilling of only a modest number of wells. Through savvy hedging and the marketing of a significant portion of its production outside of the Appalachian Basin, Rice was able to achieve a realized price for its gas of $3.18 per mcf in Q3 2015 and has 95% of Q4 2015 output hedged at a fixed floor of $3.78 per MMBTU. A similar strategy is in place of 2016. Rice has hedged 489 MMBTU (about 80% of expected production) at a fixed floor of $3.51 per mcf. Even with today’s NYMEX prices below $2.50 per MMBTU, Rice is sufficiently hedged to allow the company to generate enough cash flow to continue it delineate its high quality acreage and a large increase to its debt load. By comparison, Ultra has more than twice as much debt as Rice and only modestly higher production but has been unhedged since October 2015. UPL’s realized price for its gas production will be approximately 40% below the realized prices Rice receives for its production in Q4 2015 and Q1 2016. Given Rice’s Enterprise Value (EV) of approximately $2.7 billion and its $12 billion of identifiable long-term value, there is a lot to like about Rice Energy at today’s near all-time low share price. Despite today’s weak prices, I expect Rice to add materially to its existing $3 billion reserve base next spring when its year-end financial come out due to continued strong performance from its wells and falling drilling costs. a handful of financially strong, well-run companies able to capitalized on a changed market environment. With Rice’s outstanding acreage position, history of drilling top performing wells, strong financial position and ability to further reduce costs, there should be little doubt that the company is well positioned to participate in a turn in the natural gas market once brighter days arrive. EDITORS NOTE—My biggest position just increased its dividend in January—the only energy company in North America to do that so far in 2016. At least one analyst says this company could increase its dividend every quarter this year. Get the name and symbol of this growing dividend payer before the next increase! Click Here.